Paradise Bikes and Trikes Builds a Killer Custom Trike from Scratch. 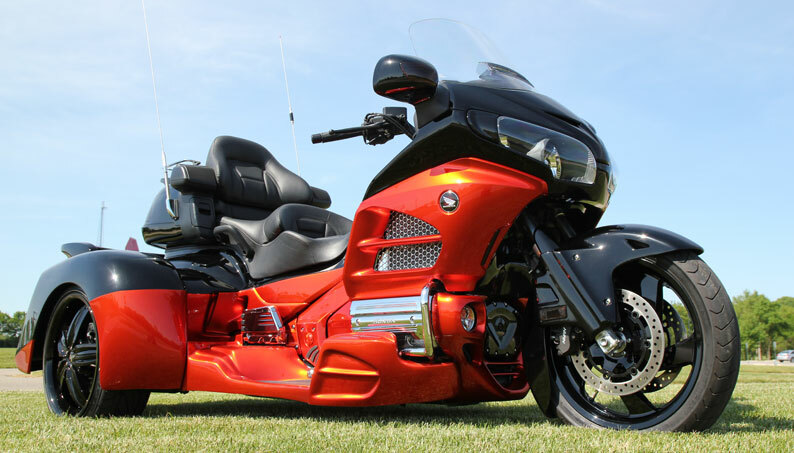 When Honda came out with the redesigned 2012 Gold Wing, it included new body work. The first one that I saw was black and silver, and I thought it would look beautiful painted candy orange and black. So I did that idea one better and we (Paradise Bikes and Trikes) added a trike kit. To start, we completely took the bike apart so we could send all of the parts to Hannigan so it could perform a one-off paint job. Neil Silverster made it all happen and Roger Garner did all the paint work. The finish is totally outstanding and the lines are just perfect. A big thanks goes out to them and everyone at Hannigan. Enough about the paint, let’s talk about the rest of the bike. On the front end we powder coated the timing cover, front wheel and rotors. We also painted the caliper covers and fork protectors, and then we smoked all the lights on the trike. The rear wheels are 18-inchers and they fill up the wheel wells nicely. 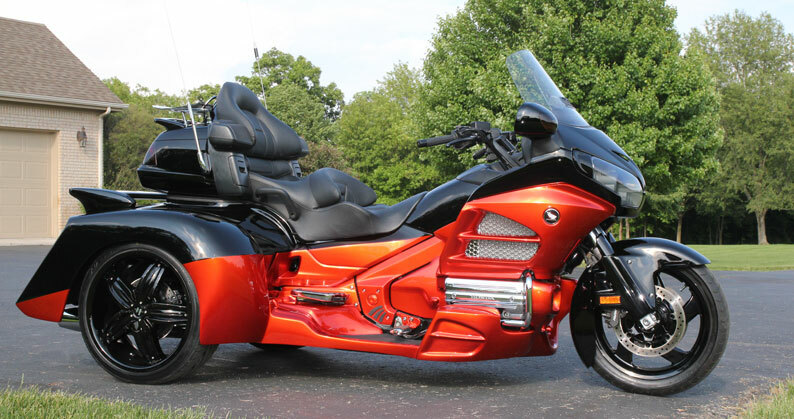 The trike has dual matching wings. The top is factory, while the trike wing is Hanningan’s Whale Tail. Both have LED brake lights that were smoked to match. The rear front fender has a molded fender extension to keep debris off the front end. We also did a clear bra on both fenders, the running boards and the lower front spoiler. This protects the paint from any damage from rocks or bugs. It will look great for a long, long time. The rear Gen2 kit looks like something from Batman — it’s wild. We also did a little chrome, all Kuryakyn transformer boards, foot pegs, brake pedal, radiator covers, chrome valve covers and trunk rack. They just add a nice touch. We also de-badged the bike so that the only emblems remaining are on the fairing — that’s it. We installed EZ-Steer on the front end, allowing it to steer smooth as silk. 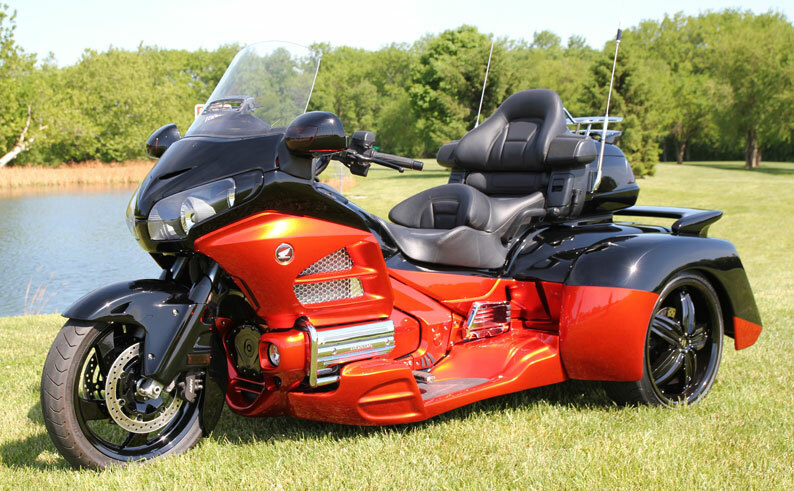 The trike kit is by far the best riding and the best handling because of its independent suspension, coil-over gas-filled shocks, sway bar, and Thunderbird rear end that bolts directly up to the factory Honda swing arm and brings much more stability. If you were to ask what inspires me to build these awesome trikes, I’d first respond Hannigan kits. 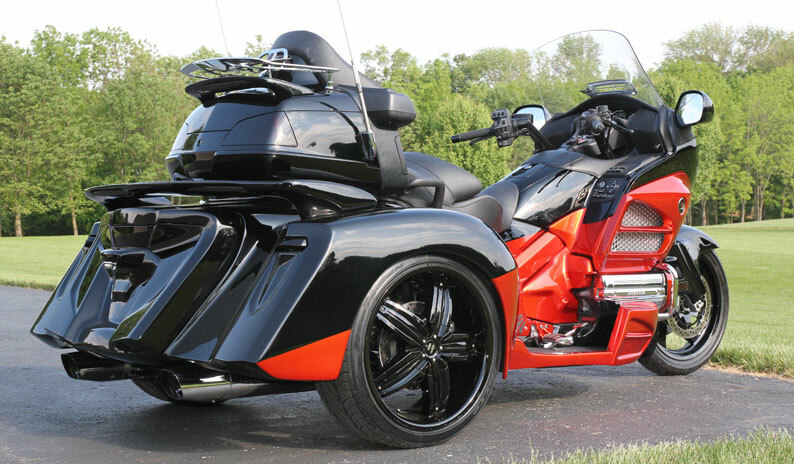 Second is that I’ve been in the custom world for 35 years building custom trucks, cars and motorcycles, and now trikes. The bottom line is that I love it. Who said that trikes aren’t cool? Anyone would be proud to ride something as awesome as this, whether they were young or old, male or female. Remember, we start out on tricycles, we wind up on trikes. Posted 02/05/2015 by wing & filed under Gear, Tech.